I posted before about "How's the weather up there?" question to tall people. 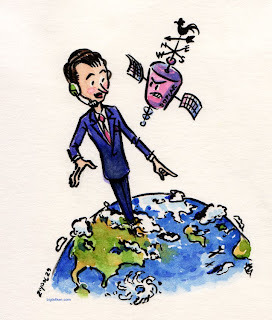 Well here is another illustration related to it - tall people replacing weather satellites. This was really an excuse to post for Illustration Friday as well. In another post I included this sketch where you can see my weather satellite complete with groundhog and trick knee. I simplified it here to go with the style of this illustration. We should be careful with satellites. We don't want angry ones falling from the sky. This is actually the third version of this. I started a more elaborate one that was too busy. Then went straight to inking without the aid of a pencil line a second, smaller version of my original sketch. I flubbed some parts. So I laid in a couple light pencil lines based on it to create this final version. I also scan the inking before applying the watercolor in case I bomb it. Then I can color the backup on the computer. The original is about 4"x4". Back in January 5, 2010 it was announced via a Yahoo! news headline that Yao Ming, the 7'6" center for the Houston Rockets basketball team, and his wife, Ye Li, a 6'2" basketball player in China, were expecting a baby. It's been six months now. In that time there have been earthquakes, volcano eruptions, tornadoes and a massive oil spill in the Gulf of Mexico. With the global economy still in a weakened state will the Earth be able to withstand the looming threat posed by the Mings' "creepy tall" offspring, which is a mere three months away? My heart trembles at the thought! Tall people must not be allowed to breed together as the consequences are much too dire! We can only hope their child's towering height will be used for the side of good! This one pretty much drew itself as soon as I read the article. "Creepy tall." How nice. The article shows the fascination/fear combination still projected onto the very tall. 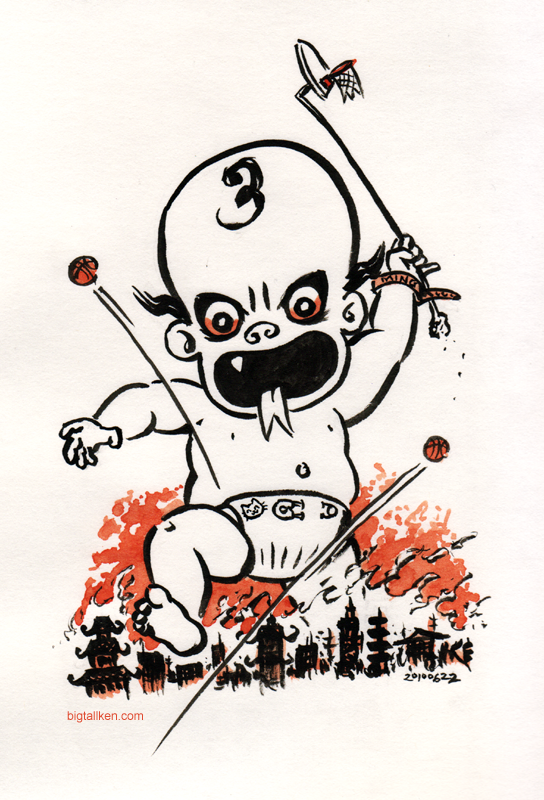 A giant baby terrorizing the city was the immediate concept. If I would have taken the time to do more research I would have tried to make the baby look more like something from an old Chinese ink drawing. I did like the basketball hoop and post being used as a weapon and the basketballs being lobbed at him, both of which popped into my head as I was pencilling in the rough. I used a brush, W&N black ink and what I think is Quinacridone burnt orange watercolor. "Give us your tall, your strong, your quick and agile, your basketball stars." America gave birth to basketball and like it or not is the global magnet for some of the best players in the world. Just look at the NBA team rosters and you find players from several European countries and some African. Thanks to Yao Ming even China is represented. Here are two other examples of new young international recruits searching for brighter future through basketball. In another post I mentioned, Marvadene "Bubbles" Anderson, at 6'10" the tallest 16 year old in the world, coming to America from Jamaica to play basketball. In another recent article two brothers coming from Canada via India, Sim (age 17) and Tanveer Bhullar (age 15), 7'4" and 7'2", respectively, to search out U.S. high schools. Perhaps one day they will make it as the "Twin Towers of India"! I had another idea for some Hindu gods playing basketball, but ran out of time and thought the Statue of Liberty was a little more universal for welcoming people to America. Image (1) is the original drawing done in ink with black Conte crayon shading. Image (2) was colored in ArtRage Studio Pro using the watercolor brush on a layer in "multiply" blend mode. In image (3) I added another layer in "multiply" blend mode with color applied with the paint roller and used the palette knife tool to soften it. I thought this might add more drama like a sunset, but it still didn't seem right. I could have tried fussing with the watercolor tool more to make it look softer and blended, but then I found David Gothard's site and drooled over his ink and watercolor work. And the ideas behind his illustrations! It's almost enough to make me give up. But no! One must press on if one is to find one's inner voice. So I went back to the original art and added watercolor to it. The Conte crayon did smear a little where it was darker but still provided a nice texture. I completed my illustration job yesterday, so here to help me celebrate is a giraffe quartet. This is an old scan of a drawing I did for my niece's birthday a couple years ago. It seemed like a reasonably sized scan at the time with a 600x800 monitor resolution. Back then I was into hand lettering after being inspired by Edward Gorey's work. Tall Tuesday: I'll Bet You Play Basketball! "I'll bet you play basketball! ", you say? "Do you play basketball? ", you ask? This is the number one question I receive from people. It's a very innocent question and makes sense when NBA point guards are 6'6". I did play basketball, but gave it up a couple years ago. There are other sports tall people play as well. Venus Williams is 6' tall. So don't be offended if you are asked, "Do you play miniature golf?" in return. I didn't have much time this week since I am actual working on a paying job. So I thought, "Oh, I'll just toss off a drawing like Robert Weber does for New Yorker cartoons." Wrong! Although the drawing did not take long, it lacks the looseness and spontaneity of his work. I used an old General's charcoal pencil, but I think was trying to force it to look like an inked line. How cocky was I to think I could master someone else's style in one take? 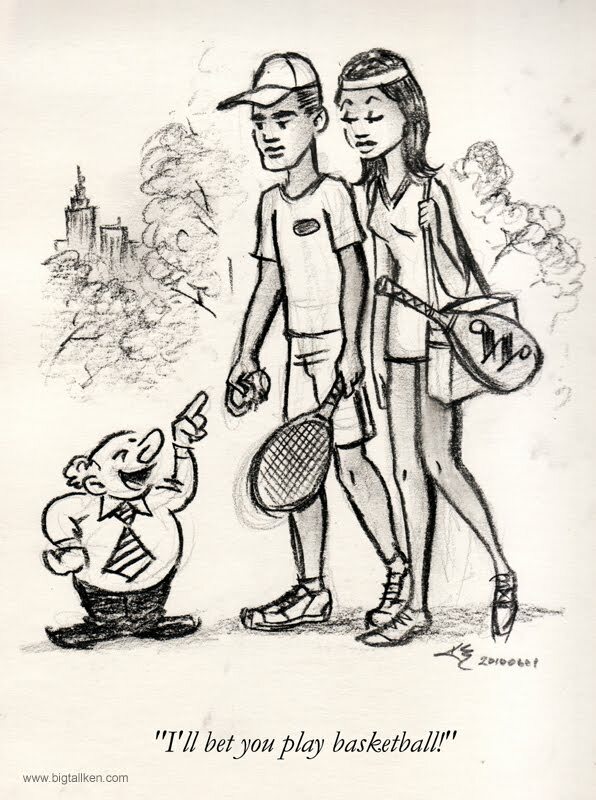 See more of his work in the New Yorker Cartoon Bank.